Oonas Dive Club Sharm ash Shaykh, Hotel Egypt. Limited Time Offer! Oonas Dive Club. "Oonas Dive Club" is a 2-star hotel. 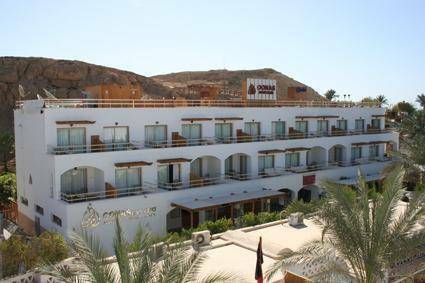 This hotel is a perfect place to stay when exploring Sharm El Sheikh. It is not far from the seashore. The decor of this hotel can best be characterised as modern. The air conditioning keeps the heat outside, always ensuring a comfortable temperature in the bedrooms. Visitors are presented the opportunity of practicing diving. The hotel includes an onsite restaurant which is known for its regional specialty. A bar is open for you to have a drink in the evening. For those who want to share their experiences instantly, there is Internet access available at no extra charge. Fantazia Hotel has a private beach with a Bedouin tent, serving Turkish coffee and shisha. This all-inclusive resort has an outdoor pool with a sun-lounger terrace. It also has a PADI-diving centre. THE MAGNIFICENT FOUR STARS DELUXE RESORT IS SITUATED INNAAMA BAY WITH AMAZING BREATHTAKING SCENERY OF BEAUTIFULLANDSCAPE.